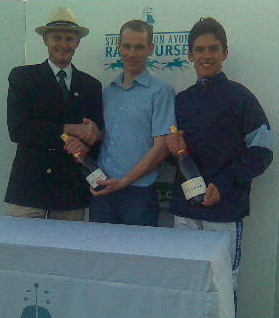 The light may have been fading when Oliver Greenall and Danny Cook received their champagne from AJA Vice President Dr Philip Pritchard at Stratford this evening but the two stars of this year’s National Hunt amateur season have bright futures to look forward to. Having turned conditional only 3 weeks ago, our NH Champion amateur runner-up (and current Fegentri World Champion runner-up) Danny Cook has already clocked up 5 wins as a professional, the latest being last night at Stratford. Meanwhile, Oliver’s winning streak has been unstoppable and he also enjoyed a winner last night in the Novice Hunter Chase on Dennis the Legend. This brought his winning tally for the season to 30, a fantastic total and a huge achievement considering that Oliver never set out to win the Championship this season, but has picked up from where his elder brother Thomas left off. Our lady NH champion amateur jockey for this season, Lucy Horner, is currently sidelined with concussion and was therefore unable to collect her champagne in person, as was Rose Dobbin, reigning champion amateur lady jockey and this year’s runner up who has now retired from the saddle to enjoy turning her attention to training. Many congratulations to our fantastic champions Oliver and Lucy, their runners up Danny and Rose, and all our members who have enjoyed riding winners this season. It was also excellent to see Jacqueline Coward at Stratford, who is making a slow but excellent and steady recovery from her head injury sustained at Wetherby back in the spring. Jacqueline has her shoulder operated on next week, as does Dickie Barrett. Good luck to all our members who are awaiting surgery or getting over injuries of which there seem to have been more than usual this season – get well soon and we all wish you a speed return to the saddle! Lucy Horner has had a great season totalling 11 jump wins so far and being currently 5 clear of her nearest rival, reigning champion Rose Dobbin, Lucy’s championship looks safe. There could be a battle on for the runner-up slot and Saturday evening’s fixture at Stratford will determine the final placings. Oliver Greenall can also relax a little, with an impressive season behind him totalling 29 wins to date and is so far ahead of his nearest rival that no one can worry him. This is a tremendous achievement after his nasty Cheltenham injury and follows Oliver’s previous season’s record breaking point-to-point feat. Danny Cook remains well clear of the remaining winning jockeys this season to secure himself the runner-up slot. Many congratulations to everyone who has ridden a winner this season and especially to our new champions, Oliver and Lucy! HOME-TEK GIVES ROSE HER CENTURY! Today saw not only the finale of the Ladies Home-Tek Hurdle Series at Wetherby with the series winner being rising amateur star Gina Andrews but also current champion lady amateur Rose Dobbin ride her 100th and final winner under Rules. Rose announced her retirement following this spare ride (replacing this season’s soon-to-crowned amateur lady NH champion Lucy Horner who is currently sidelined with concussion). Rose’s tally of 100 winners includes point-to-points and she hopes to have one more ride in a point-to-point at Hexham later this month, and then retire from the saddle to concentrate on her training career. Members of the AJA are invited to attend the AGM which will be held on Monday 8th June at Weatherbys at 11.30 am. Please advise if you are able to attend in order that catering can be arranged for you.